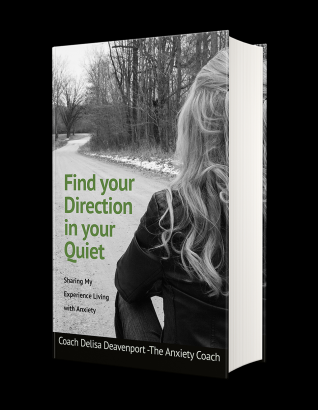 SHERMAN, Texas & PORT HURON, Mich. - March 20, 2019 - PRLog -- Author and Anxiety Coach, Delisa Deavenport's book "Find Your Direction In Your Quiet" is now available for pre-orders at https://coachdelisa.com/find-your-direction-in-your-quiet/and will be available for purchase in retail outlets in mid-April. Look for Coach Delisa's book signing events this spring and summer; the schedule will be posted on her website. Delisa writes "Find Your Direction in Your Quiet" as an account of her growing anxiety disorder journey from childhood to a young and middle-age adult when it became debilitating. The book then explains her transformation from an anxiety-ridden mess into a confident, successful, inspiring woman. She now uses her journey as an avenue for young women to understand and cope with the anxiety affecting their quality of life. The book is funny, sad, heartbreaking, victorious, hopeful, on edge, and comforting. "This book was written to give you a sense that you are not the only women going through anxiety. To arm you with the knowledge that anxiety is cunning and tries to steal your joy and you have the complete ability to move from anxiety managing you to you either managing your anxiety or overcoming anxiety all together.." Author and Anxiety Coach, Delisa Deavenport. For more information about Delisa's book visit https://coachdelisa.com/.